Solstice is available as a software-only license for Windows as an alternative to the Solstice Pod for scenarios when an in-room PC exists driving the main room display. Solstice Windows Software can be installed on a PC running Windows 7, 8, or 10 connected to a display and provides an easy way to introduce collaborative wireless content sharing to a meeting or learning space by leveraging the existing technology investment. To start using your Solstice display, first ensure your Windows host PC is powered on and Solstice is running. Next, verify the display is powered on and that the host PC is connected to the display via a video cable. Lastly, check that the host PC input is selected on the display. At this point, you will see the Solstice welcome screen on the display with instructions on how to get started. On a Windows host PC, Solstice can be set to open full screen, in a resizable application window, or a fixed resolution for the display application window size can be set. See Configuring a Solstice Display below for more information. Upon system launch, Solstice has a built-in welcome screen that informs users how to get the Solstice client software app onto their client/user devices and connect to the display. By default, the welcome screen will include instructions on how to connect to the display using their browser or AirPlay. If enabled via the Solstice Dashboard, the right-hand side bar will display calendar and scheduling information as well. 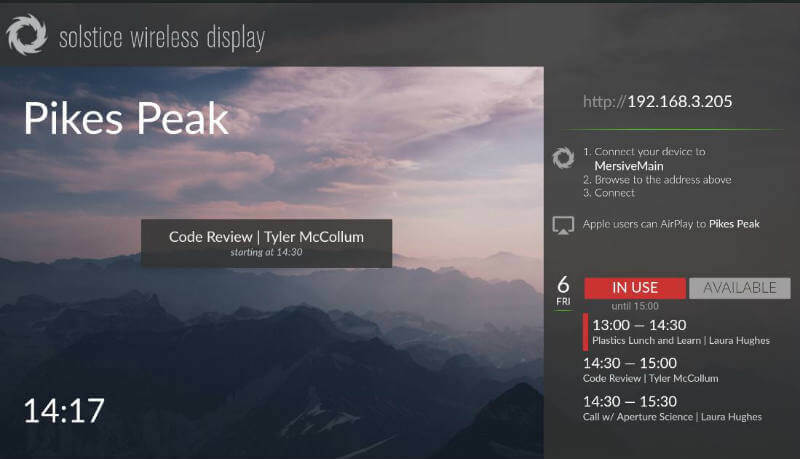 The Solstice display menu lets in-room users manually bring the display out of moderated mode, lock the display, or disconnect all users. To access the Solstice display menu when Solstice is running click the Solstice icon in the bottom right corner of the display (using a USB mouse or via a supported touch screen). Menu options include ‘Access Control’, ‘Lock’, ‘Disconnect All Users’, and ‘System’. If the presence bar is not visible, use a mouse to right-click on the display or share content to the display to show the presence bar. Access Control allows a user with access to the configuration panel to manually remove the display from moderated mode. The display may be put into moderated mode through the Solstice client. This control can be used to manually override moderation in the case that the user with moderator control left the room without closing Solstice and forgot to release the display. Lock is designed for use by end-user collaborators to use at during their meetings (if needed). Locking the display disables access to the display by any new users for the remainder of the session. Only users already connected to the display can share media. Disconnect all Users disconnects all users from the session and removes all shared content. System>Configure provides local access to the Configuration Panel. This is used by admins to configure settings such as appearance and network. The Solstice Dashboard for Enterprise Edition is a centralized management tool that provides the ability for an administrator to configure all Solstice Enterprise Edition Pods and Windows Software licenses on a network from one or multiple network admin PCs. The Dashboard also exposes additional configuration and management functionality not available from the Pod or Windows Software (server) Configuration Panels, such as the ability to post bulletin and/or emergency broadcast messages to any/all Solstice instances on the network, to encrypt Solstice network traffic, to configure discovery tags, and more. To access the Solstice Windows Software (server) Configuration Panel, first ensure Solstice is running on the Windows host PC. Then, select Solstice icon in the bottom right corner of the display interface via mouse or touch display, then ‘System’ and ‘Configure’. The Solstice Configuration Panel will appear. The Appearance & Usage tab allows the administrator to edit the settings for the appearance of the Solstice display, configure sharing options, set the preferences for launching the software, enable the display-side video folder, and enable/configure video feeds. The Solstice Windows Software (server) Configuration Panel is similar to the Pod Configuration Panel, but there are some differences. The Software (server) Configuration Panel has seven tabs on the top: Appearance & Usage, Network, Security, System, Activity, Licensing, and SDS. Display Name and Appearance allow the admin to designate the Solstice display name, as well as specify if the display name, IP address, and/or Screen Key should be visible on the Solstice-enabled display and/or in the Solstice Presence Bar (lower left section of the display). Appearance also gives options for the Solstice application window (i.e. ‘Display Mode’), changing the background during Solstice sessions, and enabling/changing the Solstice display welcome screen. Welcome Screen: the 3.1 release introduced the ‘Modern Splash Screen’ which rotates through up to 6 customizable background images with optional subtle animation to ensure there is no chance of burn-in. The modern splash screen shows connection instructions on the right half of the screen, and these instructions may be toggled on or off from the dashboard. If you prefer the pre-3.1 splash screen, you may select the ‘Classic Splash Screen’ option. Quick Connect Info: Solstice provides the option to show the hostname instead of an IP address if set up through your DNS. If enabled, this provides a more streamlined connection experience for users that would otherwise be typing in an IP address, and allows admins to mask the IP address for security reasons without interrupting user workflow. Usage and Feature Management provides admin control of the sharing options users see when connected to the specific display, ability for users to utilize browser look-in, and resource restrictions to limit Solstice’s impact on the network. For Solstice Small Group Edition (SGE) licenses, the maximum number of connections (devices) is limited to four in the ‘Resource Restrictions’ section. Note: the option to ‘Enable AirPlay Discovery Proxy’ in this section supports iOS mirroring on networks that do not allow UDP broadcast traffic and/or Apple’s Bonjour protocol. Contact your IT administrator and/or refer to the Network Deployment Guide for more information. Launch Options gives options for Solstice to automatically launch at Windows login or upon client connection, and to automatically hide upon last client disconnect. Display Side Video Folder allows an admin to enable/disable user access to a video folder on the Solstice host PC, as well as designate the location of the video folder on the host PC. Video Feeds allows the admin to configure live Video Feeds that can be shared to the Solstice display during a collaboration session. To enable a Video Feed, select the box labeled ‘Capture Source Feature Enabled’ and click Apply. Then a list of attached video sources will appear. Use the list to enable and change settings for one or multiple Video Feed sources. Refer to the next section, Video Feeds aka Attached Sources & Using Frame Grabber to learn more. Web Server Proxy allows Solstice Windows Software instances to be activated and licensed when deployed behind a secure web server Proxy. Both http and https options are available with web proxy IP address, port designation, and login credentials required for both. Communication Ports allows the administrator to select the Solstice base port and reflects changes to additional ports when the base port is changed. Solstice always uses three sequential ports beginning with the base port, plus port 80 for web configuration and the client server. Administration allows for password-protection of access to the Solstice Configuration Panel, in order to restrict access to the configuration options and/or lock a specific configuration. When a password is set here, anyone that tries to access the configuration panel will be required to enter the password. Screen Key Enabled allows only those who can see the Screen Key in the bottom left corner of the Solstice Display to connect to the session by entering the key. When the Browser Look-In feature is enabled for the display, users that attempt to utilize the browser look-in feature will be required to enter the display’s Screen Key. Clearing this box allows anyone on the network to connect to a display with no restrictions. Moderated Approval enables or disallows moderated sessions. If enabled, a user may connect and start a moderated session. The moderator and will have full sharing rights and control of the display. Non-moderator ‘Guest’ users can request to join the session, but both joining and sharing media posts must be approved by a moderator, and guest users do not have control of posts on the display. Moderators can also promote guest users to moderator status once both are in the session. System allows an administrator to designate the time format used (12 or 24 hour), the language (English, Japanese, German, Spanish, French, Italian, and Traditional Chinese currently supported) and restart the Solstice Windows Software (server) using the admin restart tool. Activity tells the administrator real time information about the display, including the display name, what version of the Solstice Windows Software (server) is running, number of connected users, number of posts, bandwidth usage, and live sources in use. Licensing provides details about the current Solstice Windows Software (sever) license, including license status, display name, software version, maintenance status, and device fulfillment ID (under ‘Device Info’). This section also gives options to check for updates, install updates, activate licenses, and recall licenses for use on a different host PC. Non-enterprise Solstice Windows Software licenses can also be upgraded to Enterprise Edition through via the licensing tab. SDS shows options for Solstice Discovery Service (SDS), which is an IT-friendly mechanism for display discovery (i.e. click-to-connect capability) that works across an enterprise network without requiring broadcast traffic for discovery. SDS is a complimentary software program that runs in tandem with Solstice Windows Software (server) on the network. See the Solstice Discovery Service (SDS) User Guide for more details about SDS. Solstice Windows Software (server) running on a host PC is able to integrate with external video sources using a frame grabber or capture card. 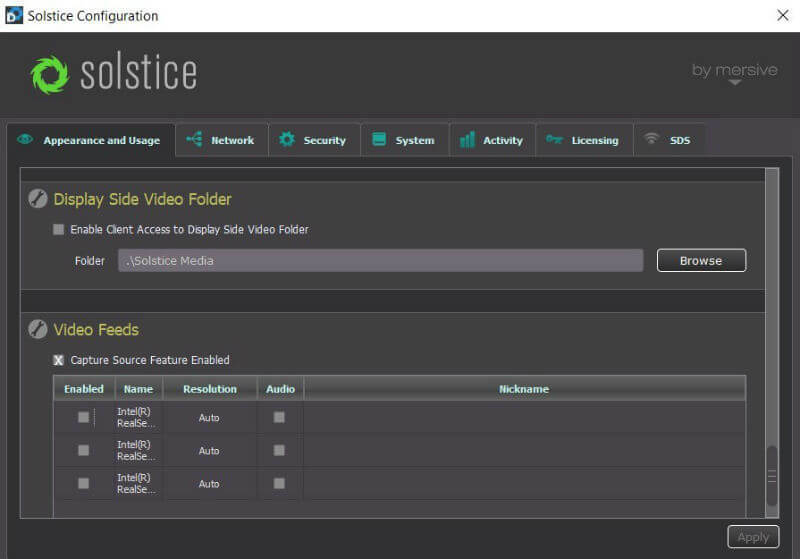 Using the Video Feeds feature from the Solstice Windows Software (server) Configuration Panel, a Solstice session can include live feeds with audio from any video source connected to the display host PC. External video feeds could include video conferencing equipment, DVD/Blu-ray players, video recorders, etc. It is recommended that users connect USB video sources to integrated USB slots on the host computer’s motherboard, rather than stand-alone USB cards, to reduce the processing and memory demands on the computer. Generally, integrated USB slots are located on the back of the host machine. To utilize attached video sources, the Solstice Windows Software (server) host PC must have a DirectShow compatible frame grabber or capture card. Install the card per the manufacturer’s specifications. Install the drivers that came with the card. Please note that audio is only supported on certain frame grabber cards. Check the manufacturer’s specs to determine if the card supports audio. For Apple TV or HDCP-protected content to be shared, a Datapath frame grabber card is required. Once the card is installed and the external source is connected to the display host computer, launch Solstice. 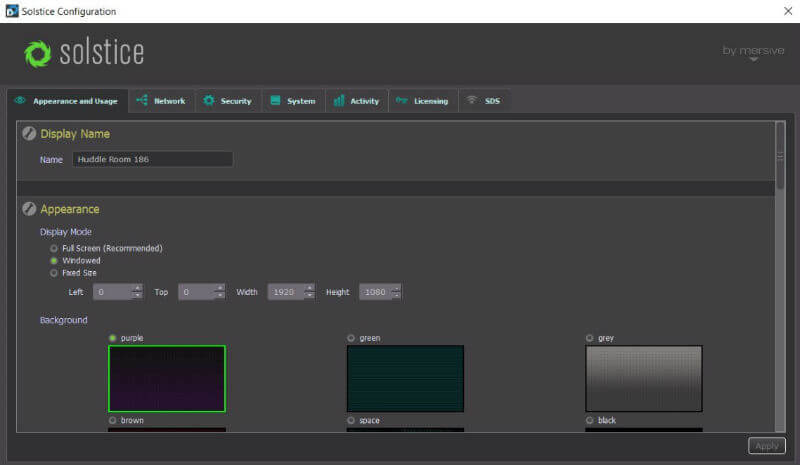 Access the Configuration Panel via the Solstice display menu, and then under the ‘Appearance and Usage’ tab, scroll down to the Video Feeds section, check the box next to the ‘Capture Source Feature Enabled’ and click Apply. A list of attached Video Feeds will appear. Enable each feed individually in the first/left column. To change the resolution of the Video Feed source, double click the Resolution column, and click the arrow for a dropdown menu with resolution options. If the frame grabber or capture card supports audio, select the box in the Audio column. Click Apply when all settings changes are complete. Once the Video Feed is enabled in the Solstice Configuration Panel, click Apply. Then, on the Solstice display interface, click the Share Media Button in the bottom left corner of the display, then click ‘Attached Sources’ and select the name of any Video Feed(s) enabled in the Solstice Configuration Panel. Solstice Software for Windows requires certain minimum specifications be met by the Windows host PC that is connected to Display and running the Software. These specifications include a Windows 7, 8 or 10 operating system, an Intel i5 or better processor, and DirectX 11 or better graphics. 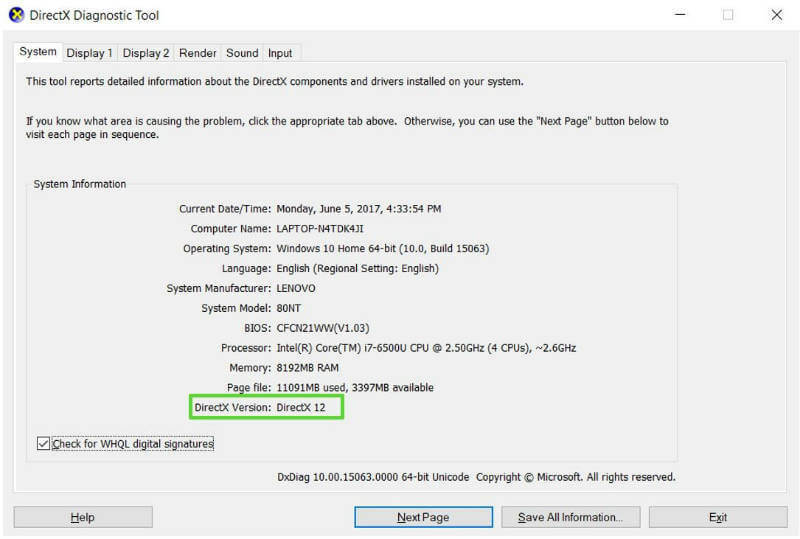 This guide will help you verify that your Windows host PC has DirectX 11 or better graphics. NOTE: DirectX 11 is not required for Solstice users running the Solstice apps on their laptops or mobile devices. Please refer to the Solstice User Guide for more information about the Solstice client apps. 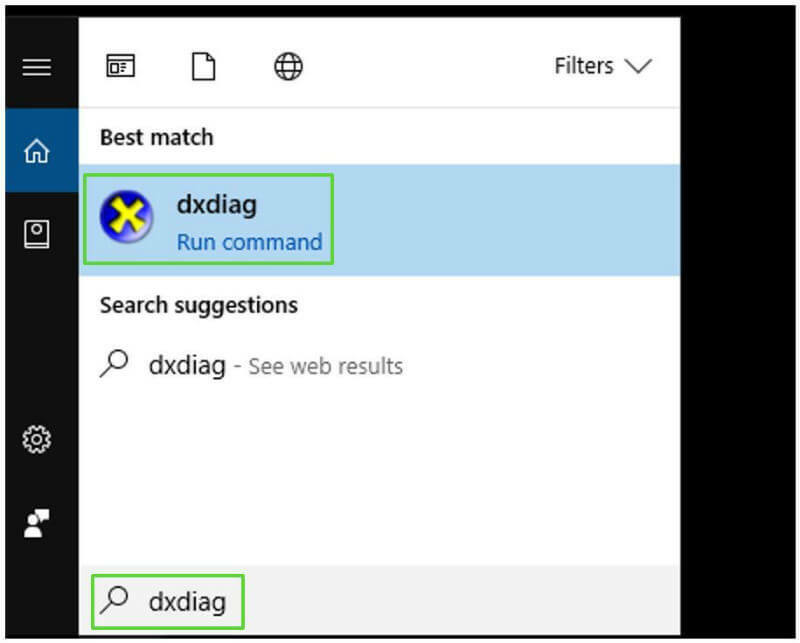 From your host PC, open the Windows start menu and search for the DirectX diagnostic tool by entering ‘dxdiag’ in the search box. Find the ‘dxdiag.exe’ program in the results and select it to launch the program. Once the program launches, check the software version of DirectX on the ‘System’ tab and verify it is 11 or higher. Next, check the hardware version of DirectX, which is labeled ‘DDI Version’ on the ‘Display’ tab. It should also be 11 or higher. If both the DirectX software and hardware versions are 11 or higher and your Windows host PC meets the other minimum specifications, you can proceed to install and use Solstice Software. If your DirectX software version is not 11, you can update to the latest version of DirectX through Windows Update. If your DirectX hardware version, labeled ‘DDI Version’ in the diagnostic tool, is not 11 or higher, you will need to update the host PC’s graphics card or select another host PC on which to install Solstice Software. For more information, please contact Mersive Technical Support. Need help activating or managing your licenses? Check out our detailed support article here . The Solstice Windows Software (server) that runs on the Solstice Windows host PC is a licensed Mersive product, as is the version of the server software integrated on the Solstice Pod. A free trial version of the Solstice Windows Software (server) is available. Permanent Solstice Pod and Windows Software licenses are available for purchase from Mersive and its authorized resellers. Solstice client apps are free. With a Solstice Unlimited software license (for Windows or Pod) an unlimited number of clients/users can connect to the display. With Solstice Small Group Edition (SGE) license (for Windows or Pod), up to four clients/users can connect to the display at one time. Mersive also offers Solstice Enterprise Edition licenses for both Solstice Pods and Windows Software, available in both Unlimited and SGE versions. The Solstice Enterprise Edition license provides support for the Solstice centralized IT management Dashboard and offers additional features designed for the enterprise deployment environment. Non-enterprise Solstice Pods and Windows Software licenses can be upgraded to Enterprise Edition. Upon purchase of Solstice Windows Software (server) for Windows, you will receive a welcome email with login credentials to the Mersive Download Center. Once logged in, click the appropriate link to start the download. After the download is complete, follow the prompts to install and launch the software. You will also receive email notifications when subsequent software updates are available for your license. The process for installing updates is similar: use your login credentials to access the Mersive Download Center to download the update, then follow the prompts to install the update. If you have a Solstice trial, you will see the reminder screen every time you start the Solstice Windows Software (server) until it expires in which case the expiration notice will not go away. Once you have purchased a license, you will receive an activation code via email. Enter this activation code as it appears in the email into the license key box that appears when you start Solstice. You will also receive access to the Mersive Download Center via email, through which updates and new versions of the product will be delivered. You will be notified when updates are available by email sent to the email address associated with your account.